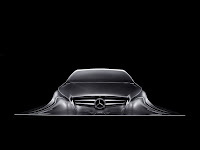 Designing Cars: Mercedes-Benz Design Sculpture "Rising Car"
Mercedes-Benz Design Sculpture "Rising Car"
At the 2010 Detroit Motor Show Mercedes-Benz has presented an automobile sculpture that portrays a concept car body taking form and rising from a liquid surface. The artwork hints at the brand's design language evolution for the next future models. 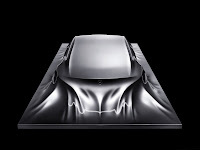 The sculpture, named "Rising Car", represents a Mercedes-Benz Concept body taking soft, flowing form from liquid - or as if it was covered by a "shimmering cloth" draped over. The nature-inspired artwork has been revealed at the 2010 Detroit Motor Show and gives hints on the evolution of the brand's design language, with art-deco elements inspired by the 1930's. In particular, it could preview the general lines of the next-generation CLS four-door coupé, that should be unveiled within this year. From the official Press Release Click Here!